The answer key of Raj Prison Jail Prahari exam will have the answers of all the questions asked in various sets of the written examination. Rajasthan Prison Department had conducted a written test for the posts of Jail Prahari (Prison Warder) on 24 January 2016. The test have MCQ based questions which candidates have to answer in a OMR Sheet provided. Now Jail Prahari answer keys are going to be released by rajprisons.in. 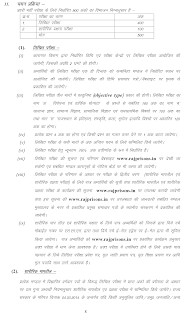 Go through this page and get Rajasthan Prisons Warder Exam answer key from below. Rajasthan Jail Prahari screening test was held on 24 January 2016. Those who clears written exam will have to appear for Physical exam for which dates will be notified later. Physical Test will carry 100 marks. The written exam have objective type questions. The paper was of 400 marks and 2 hours time was given to solve them. Questions have been asked from General Awareness, Interpretation and Reasoning Ability and Rajasthan History, Culture, Geography etc. To clear the written exam, candidates have to obtain 36% marks.